When the depression hit in the 1930s, the unemployment crisis made Canadians particularly intolerant of immigrants. A recent surge in immigration just before the thirties added an unnecessary flood of workers just when Canada needed them least. Prime Ministers Mackenzie King and R.B. Bennett reacted to public pressure by severely restricting immigration to a narrow range of "acceptable" applicants - those with money, agricultural skills and British or American roots. Some new arrivals returned home, others were forcibly deport: to banish or expel.deported. The ones who remained were subjected to an increasing xenophobia: a hatred or fear of foreigners or foreign things.xenophobia that was spreading through the country. 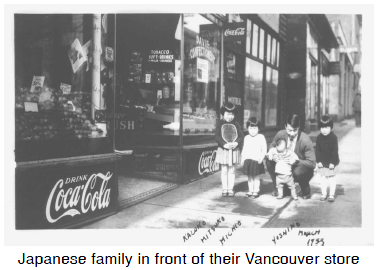 In British Columbia, Asians lost the right to vote and were banned from some jobs. Jews were also a target of discrimination. 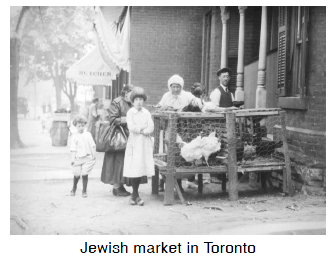 The anti-Jewish attitude in Canada was demonstrated by the few Jews who were allowed refuge in this country during Nazi persecution in Germany. While countries like the United States took in 240,000 Jews, Palestine took 100,000 and Great Britain 85,000, Canada opened its doors to only 4000 Jewish refugees in the thirties. Although socialist ideas were popular in the grim economy of the depression, the Communist party was feared as a "foreign" ideology promoted by European radicals. Communist leader Tim Buck was arrested and imprisoned and other Communist party members were deported. The Canadian-born Co-operative Commonwealth Federation was a more popular choice for Canadians seeking reform. Immigration was almost completely halted during the depression and did not pick up again until after the Second World War when war-weary Europeans sought a fresh start in Canada and our economy needed their skills. It wasn't until the sixties that Canada began to take in immigrants from non-white areas like the Caribbean, Latin America, Africa and the Middle East. Government multicultural policies encouraged new Canadians to retain their cultural differences while ESL (English as a Second Language) courses attempted to help newcomers to English-speaking Canada learn the language. Language policy in Quebec required its immigrants to send their children to French-language schools. As another major recession took hold in the late eighties and nineties and Canadians grappled with a huge debt and deficit: the amount by which government income falls short of government spending in a given year. To make up the shortfall governments borrow and this is added to the debt.deficit, tolerance of new immigrants was again put to the test and governments were pressured to restrict immigration and refugee claims. Immigration began to decline on its own anyway, because Canada's poor economy offered fewer incentives for people to come.